Searching for the best of the best in scanning devices? The MS840BT has it all! This scanner combines all high quality features which you can find only in separate devices and offers a mind blowing solution for a great price. Choose only the best. Choose MS840BT. 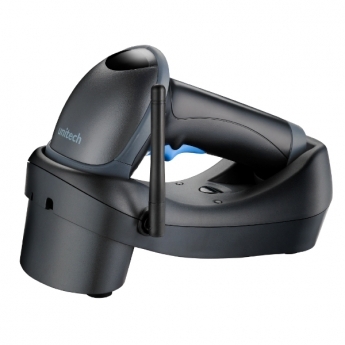 The Unitech MS840BT wireless laser scanner is enriched with a high-speed Mantis decoder and a powerful scan engine to optimize data capture efficiency. With 100 scans per second and an operating time of more than 10 hours the MS840BT will last for a complete working day without interruption. Providing different configuration capabilities (USB, RS232 and PS2), creating a connection is convenient with the MS840BT. This scanner also supports HID and SPP protocol, allowing users to connect to a PC, PDA or tablet directly without the need of a cradle. Combine these features with the multi point-to-point function, allowing 3 guns to transmit and secure data to one cradle, and you'll be convinced it's a complete and future proof device! Able to withstand multiple 1.8 meter drops to concrete and IP42 sealing against water and dust, the MS840BT can maintain its high performance in any environment. With a wide range of high quality features this wireless scanner is a perfect fit for industries like retail, light warehousing and sales automation. With the ability to scan up to 100 meters from the base station the MS840BT provides the greatest flexibility and productivity for users. Due to the wireless design users can move without restrictions for real-time data connection, while maintaining comfort over long periods of use. The MS840BT stores data in a buffer mode while it is out of range of the wireless signal, uploading the data when it gets back in range. Ideal for various applications, for instance: dispatching, document tracking and tablet scanning. The MS840BT is easy to operate. With a cradle that can mount to a desk or wall, a long life trigger design and page calling for scanner tracking, the MS840 BT provides endless convenience and ease-of-use. While lowering the overall investment cost you can do more for your business! Connect directly (without cradle) to tablets, POS, etc.